After researching and taste-testing hundreds of burgers, the team founded Burger 21 and went to work creating the restaurant’s menu, décor and culture.The first Burger 21 location opened in the Westchase area of Tampa, Fla., in November 2010 bringing people of all ages together to enjoy innovative and delicious recipes for gourmet burgers, fries, salads, shakes and more in a modern and fun environment. From the start, it was typical to see tables filled with families of three generations engaged in conversation over Burger 21’s unique burger creations such as The Ahi Tuna, Tex-Mex Haystack and The Skinny turkey burger and signature shakes like Bananas Foster and Key Lime Pie. Burger 21 established a clear and fun culture from day one, which is best described by our creative “B-isms” – which range from “B-saucy” and “B-different” to “B-comfortable” and “B-involved.” Prominently outlined on the back of the menu and painted on the walls of the restaurant, Burger 21’s “B-isms” boldly state the brand’s values and what our customers can expect from our food and service. As part of Burger 21’s culture, we are committed to the communities that we serve – with each restaurant donating 10 percent of the day’s proceeds to a local charity or school on the 21st of each month. To date, Burger 21 has provided more than $120,000 in contributions to local charities and schools. 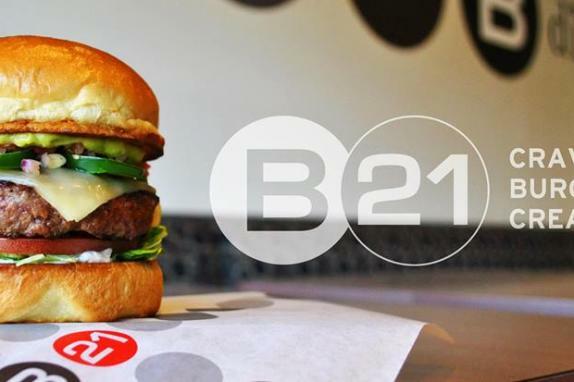 Leveraging more than 25 years of franchising experience and a sophisticated support team, Burger 21 is rapidly growing across the U.S. on a quest to provide burger lovers with a taste experience beyond the better burger.